Dedicated June 27, 1897, Vance Memorial Presbyterian was built as a memorial to the parents of Wheeling businessman James Nelson Vance. 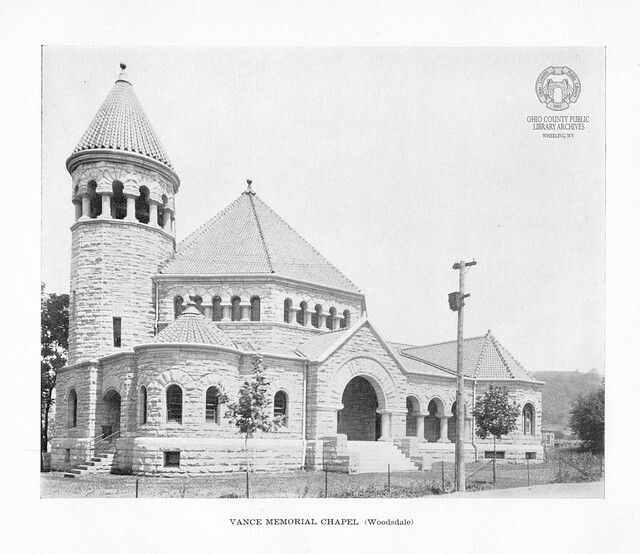 Vance purchased the land - near where he had been born - in 1896 and donated the money to build the Richardsonian Romanesque chapel designed by the architectural firm of Franzheim, Giesey & Faris. ▶ Read the newspaper article from the June 27, 1897, dedication. ▶ Vertical file: Wheeling Presbyterian Churches. Wheeling Room, non-circulating, ask for access at the Reference Desk. ▶ Archives Vertical file: Wheeling Presbyterian Churches. Archives & Special Collections, non-circulating, view by appointment only.